Register now your email address and never miss events, dates and news for CANNIBAL CORPSE. Cannibal Corpse is an American death metal band from Buffalo, New York. Formed in 1988, the band has released twelve studio albums, one box set, and one live album. Throughout the years the band has been established, they have had little radio or television exposure, although a cult following began to build behind the group with the release of albums such as 1991s Butchered at Birth and 1992s Tomb of the Mutilated which both reached over one million in worldwide sales by 2003, including 558,929 in the United States, making them the top-selling death metal band of all time in the US. The members of Cannibal Corpse were originally inspired by thrash metal bands like Kreator, and Slayer, as well as other death metal bands such as Morbid Angel, Autopsy and Death. The bands album art (most often done by Vincent Locke) and its lyrics, which draw heavily on horror fiction and horror films, are highly controversial. At different times, several countries have banned Cannibal Corpse from performing within their borders, or have banned the sale and display of original Cannibal Corpse album covers. Cannibal Corpse was established in December 1988 by members from three earlier Buffalo-area death metal bands; Beyond Death (Webster, Owen), Leviathan (Barnes), and Tirant Sin (Barnes, Rusay, Mazurkiewicz). The band played their first show at Buffalos River Rock Cafe on April 1989, shortly after recording a five-song demo tape, Cannibal Corpse. Within a year of that first gig, the band was signed to Metal Blade Records, apparently after the label had heard their demo that was sent in by the manager of the record store at which Chris Barnes was working, and their full-length debut album, Eaten Back to Life, was released in August 1990. The band has had many line-up changes over the years. In 1993, founding member and guitarist Bob Rusay was dismissed from the group (after which he became a golf instructor) and was ultimately replaced by Malevolent Creation guitarist Rob Barrett. In 1995, singer Chris Barnes was dismissed and was replaced by Monstrosity singer George "Corpsegrinder" Fisher. Barnes went on to perform with the band Six Feet Under, and later Torture Killer. In 1997, Barrett, who had originally replaced Rusay on guitar, left Cannibal Corpse to rejoin his previous bands Malevolent Creation and Solstice. After Barrett left, he was replaced by guitarist Pat O’Brien, who first appeared on Cannibal Corpses 1998 release Gallery of Suicide. 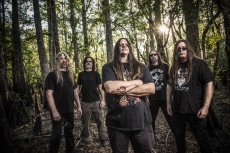 Founding member and guitarist Jack Owen left Cannibal Corpse in 2004 to spend more time on his second band, Adrift. He joined Deicide in late 2005. Jeremy Turner of Origin briefly replaced him as second guitarist on 2004s Tour of The Wretched Spawn. Barrett rejoined the band in 2005 and was first featured on the album Kill, released in March 2006. Writing for the next album began in November 2007, as presaged in an interview with bassist Alex Webster. Evisceration Plague, Cannibal Corpses eleventh studio album was released February 3, 2009, to a highly positive response from fans. They also released a live DVD in 2011 entitled Global Evisceration. Cannibal Corpse has finished recording a new album, entitled Torture, which was released on March 13, 2012.